Ask any Gay Man of a Certain Age, and he will tell you about the horrors that were the 1980s in America: a backlash decade after the revolutionary 1960s and hedonistic 1970s, a decade defined by the policies of Ronald Reagan and Margaret Thatcher, when Gay men could be discharged from the military with impunity, before any notion of marriage equality, and that above all saw the onset of AIDS. The 1980s too had an over-the-top element to them, as exemplified by the emergence of the materialistic “yuppie.” They were also the decade of the glamorous Diana, Princess of Wales, the gender-bending Boy George and Annie Lennox in popular music—not to mention the ground-breaking Madonna!—and the outrageous resistance of ACT-UP. 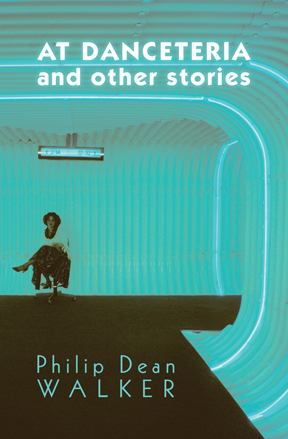 Philip Dean Walker explores the paradox that was the 1980s throughout his At Danceteria and Other Stories, a slim volume of seven stories (four of which are reprinted from Jonathan: A Queer Fiction Journal). In six of these stories, the protagonist is some (now dead) icon from the 80s: Halston, with Liza Minelli and Andy Warhol (“By Halston”); Princess Diana (“Don’t Stop Me Now”); Rock Hudson (“Charlie Movie Star”); Sylvester, with a Bette Midler cameo (“Sequins at Midnight”); Jackie Onassis (“Jackie and Jerry at the Anvil”); Keith Haring (“At Danceteria”). Several stories are set in iconic bars that likewise are no longer with us: Studio 54, The Anvil, and Danceteria in New York (all closed 1986); Tracks in Washington, DC (closed 1999); and the Royal Vauxhall Tavern in London (still going strong). The center (literally) of the collection is held by “The Boy Who Lived Next to the Boy Next Door,” the only story without a celebrity, not even a cameo. Narrated by an anonymous (and presumably average-looking) protagonist, he describes the new gay cancer—or, as he dubs it, “Hot Guy Flu”—since he observes that only the good-looking guys are succumbing to it. As a result, he unexpectedly finds himself suddenly desirable, even by the attractive who had previously spurned him; until finally even the not-so-attractive start dying. To survivors of the 1980s, the discovery of AIDS remains a watershed event, a point after which the world irrevocably changed. Its specter haunts all of Walker’s stories to a lesser or greater degree, but it is not the only truth of the decade. Walker acknowledges both extremes of the 1980s, the horror and the glamour. In so doing, he produces something mighty real, which is more than just plain real.